A venue teaming with freshly cut flowers will certainly add to the opulence of a wedding - but it will also add to the costs. Fear not! 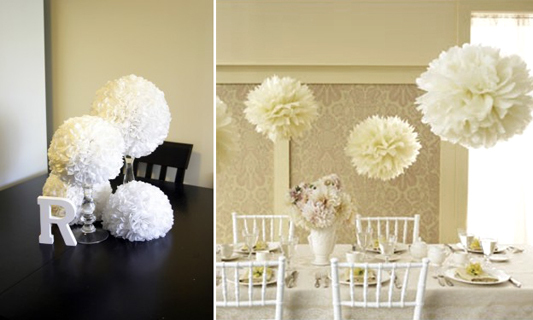 These pictures aren't of bunches of white chrysanthemums, they are in fact tissue paper pomanders, and on mass can be pretty effective. Suspend them from the ceiling or display them as table centrepieces. There is a very simple step by step to follow over on Project Wedding.